"Recent days have brought out the first signs of spring. You can see a green or red "haze" around many of our deciduous trees and shrubs indicating the first budding of flowers and leaves. The buds on our many rhododendrons are also maturing quickly and our pines are dropping the last of their needles to make room for new growth. In a few weeks those flowers will open and leaves unfurl in just a few days. Insects are also beginning to appear in profusion, matching the sudden appearance of new vegetation. "You may have noticed the reappearance of our groundhogs (or woodchucks). Unlike their relative, the Gray Squirrel, groundhogs have been hibernating in their burrows since October. A burrow may be 2 to 4 feet below ground level and extend for 25 to 30 feet. A burrow's main opening can be identified by the nearby pile of excavated dirt, but a burrow usually has one or more hidden openings dug from the inside. These allow the groundhog to escape quickly should a predator try to enter the burrow. "Birds and other animals are dispersing and trying to establish new territories. Mallards are pairing off from their winter flocks and searching for nesting sites. 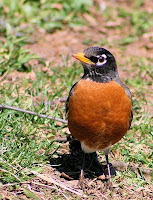 You can see orange-breasted male American Robins jockeying for position on our grassy areas. The feathers of the males of species such as the American Goldfinch or Northern Cardinal are particularly brightly colored this time of year. And many birds are beginning to sing loudly (especially around dawn) to attract mates. "This is also a time of transition. Winter visitors such as mergansers have already left, and while juncos are still here, they will soon be replaced by warblers and other migrants from the south."